Properly covering a load to avoid a car accident could save a life. When something from your load falls out, you will then be liable if the hazard causes a car accident. 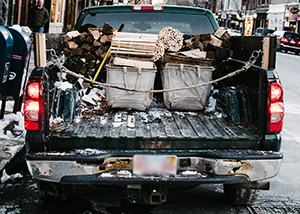 Always remember when hauling materials, or carrying a load, be sure that the load is properly fastened down. Certain types of loads are required to be covered, such as loads of dirt, sand, or gravel. Even when you are not carrying a load, be sure to pay attention to what is on or around your car before driving, and never throw materials out of the car on the road. If glass or any other object becomes dislodged from your car, or is thrown from the vehicle onto the roadway, you can be liable for subsequent damages, and even charged with a crime. (b) Any vehicle with deposits of mud, rocks, or other debris on the vehicle’s body, fenders, frame, undercarriage, wheels, or tires shall be cleaned of such material before the operation of the vehicle on a paved public highway. After a car accident, you need an experienced car accident lawyer in Spokane to handle your case. Contact the professional and experienced personal injury attorneys at Parke Gordon Law Firm to handle your case. Our law office believes every client deserves fair representation against big insurance companies with deep pockets. Call now our Spokane law office now at (509) 482-7274 for a free case review. We can usually tell you over the phone if you have a good case.